A practical book bursting with ideas on how to tune children into sounds and have fun with language. This flip book has one side dedicated to practical, engaging ideas and alliterative rhymes and the other has beautiful illustrations and photographs to initiate conversations. Can be used with or without the alphabet bags. A play paired hands-on approach encouraging the use of interesting and varied vocabulary. 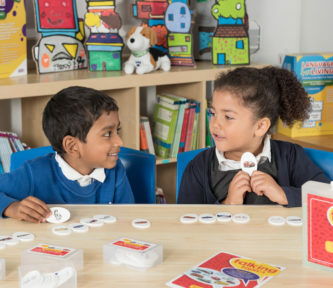 Whilst it compliments the other resources it can be used independently to engage the children and encourage conversation as well as providing practitioners with suggestions. It could be about making lovely lemonade etc. Beautifully illustrated with some fun alliteration sentences eg. Petunia plays the panpipes from Peru whilst wearing her pearls.